I doubt anyone even reads my blog anymore now that I have returned... but I still think I am allowed to write, even without pictures of camels. :( Tragic I know, I miss Egypt too. Actually today I went to the "opportunity fair" on campus and I talked to the student relations director of the Jerusalem Center. I said, "Hi this is great booth- I just got back, but still it's a great booth, I wanted to stop anyway." She probably thinks I am weird but I just needed some Jerusalem brochures to get me through the day. Right after that I talked to the Washington Seminar booth lady and I thought I had to have some future in politics to be able to intern with that program in DC- but apparently they have two BYU students working at the Hishhorn contemporary art museum. Sweet, right? I could do that as an internship- well I don't know if I could it would take lots of applications and money and desire and passion, ya know. But still- a good option. After that I went to the honors booth. I took a few honors classes for my generals because I heard they were easier (little did I know- that means less work but more thinking... aka rough stuff). So I thought hey I have taken a few classes maybe I should just keep going and do the other honors requirements. Which apparently I am close- all I have to do is take more 12 honors courses, 2 semesters of 200-level language classes, read 12 books from their list, go to 12 plays on their list, 12 concerts, 12 films, 12 "science experiences" -what is a science experience?, and 12 art exhibits... all from their special list. Then I get to choose 2 from each topic and submit a paper about it. Then I must do a thesis project and create a portfolio with a bunch of stuff, documents of some sort. So the lady at the booth went through all that stuff and then I saw something at the bottom. GPA requirement 3.5. I said, "So you're telling me you could do all this work and then your final semester you are at graduation and you realize that you only have 3.49 - then you don't graduate with honors?" She said, "yep that's right." Moral of the story- don't plan on seeing me with honors in a few Aprils from now. On a more happier note- I really like walking to campus. It takes me longer this semester because I live pretty far from the art building but luckily it is actually enjoyable. I walk past 2 bus-stops, I get to go on two crosswalks of busy roads-- that adds lots of excitement. Best of all- I walk past the duck pond at least 4 times a day! There are probably 30 ducks in the little iced over pond but they quack and waddle and are as cute as ever. Worst part of my walk- no one has classes the same time I do (8 am every morning!) so I end up doing this path by myself most the time. Before you get sad for me- it isn't all bad. Sometimes I get to play games. Yesterday I played one that got a little dangerous. I walked as long as I could with my eyes closed. At first I couldn't go one cement block (from one crack to the next). Plus some pieces are a little off - lower or taller than the next block which causes tripping, tripping is not good to do south of campus. I have done it before and it was way embarassing- not to mention painful. At any rate, I still faced my fears and kept closing my eyes. I got up to 20 steps all with my eyes shut! It was funny because I would go a few steps and then I would open my eyes and start laughing and I bet it weirded out anyone watching. Especially the one time when I was at 13 steps and I was feeling good because it was a pretty straight-way, but alas I came to right as I crashed into a mailbox off the side. I think my body is aligned to the right because I kept going crooked that way. I should probably get that checked out. I think he is most famous for this piece. 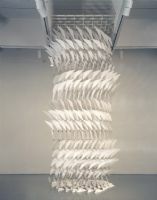 It is in DC at the Hishhorn and it is made out of hangers. Pretty like birds right? I would also like to encourage people to listen to Nickel Creek. I am wearing grey pants with a green shirt today and everytime I do this color combo I like to listen to "Green and Gray" and then I remember how much I love Nickel Creek even though I can't tell which part is the melody in the chorus of this song. Oh and thanks Emily for buying me this CD several years ago. Ok I'm done. Happy Thursday. One of my favorites. He said that he worked in food service and he always had to take out the trash- and these were the kind and color they had. He talked about how much he loves the feeling of opening a new trash bag and lining the container. How fun it is to pop the air into it and see it open up, how it provides a fresh, clean start for whatever may come. So he blew up all these bags and made cool shapes by tying the drawstrings together. Pretty neat.